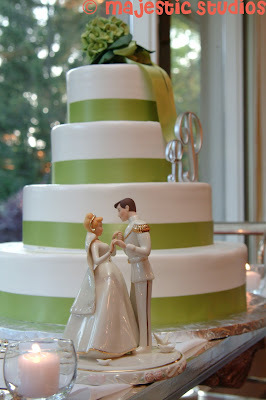 I married my Prince Charming in July 2009 and we decided early on that while we wanted summery colors and a light airy theme to our wedding we weren't going to have a full on Disney theme. I was more delighted coming up with small touches that would be personal and maybe even unnoticeable to others. A"Once Upon a Time" theme came out at our engagement party with invitations, the awesome cake (pictured above) made by my talented mom and pumpkins here and there. At a Christmas trip to New York City I picked up Mickey green stone stud earrings for my bridesmaids to wear on our big day. We ended up with some more classic Cinderella nods at the wedding because our cake topper (which was too heavy to sit on the cake and instead stayed nearby on the table) was the Lenox Cinderella one and my dad and I danced to Stephen Curtis Chapman's 'Cinderella'. I wore blue toenail polish as my "something blue" that was called Cinderella's dress. Finding the little fairy tale touches without being over the top turned out to be a fun way to bring our personality into the wedding.